Working in the Oakville, Burlington and Milton Markets - OAKVILLE ON - Cathey Mills, Royal LePage Real Estate Services Ltd. Specializing in Oakville, Milton and the Surrounding Areas. Working as part of The Mills Team with over 35 years of combined Real Estate experience. Buying or selling a home is a big decision - you need an experienced professional to guide you through the process. When you work with me, you can count on personal, attentive, patient service, excellent knowledge of the area, great negotiation skills, and expert selling strategies. As a Realtor for over 12 years my job is to help people find their perfect home. However, as a volunteer and fund raiser for both the Halton Womens Shelter and The Royal LePage Shelter Foundation, I know that ‘Home’ sometimes isn’t a safe place, that is why I donate a portion of every sale I make to help put a stop to domestic abuse. I want every Man, Women, and Child to feel safe in their ‘Home’. Working to help put abuse out of commission. 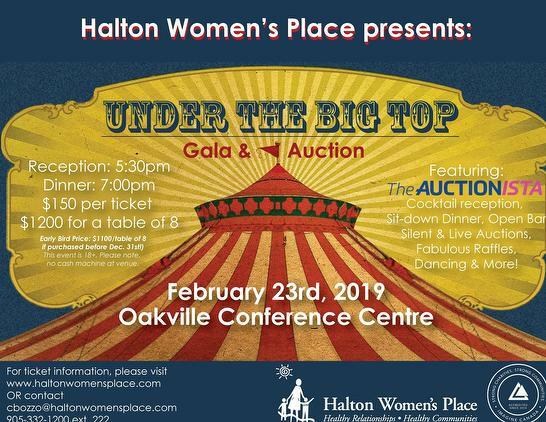 Don't forget to purchase your ticket to our Under the Big Top Gala & Auction, which is just one month away! Unable to attend? We have other ways to support our Gala and HWP including sponsorship opportunities and donating to our silent auction!